I remember when I was younger… and it doesn’t seem so very long ago… thinking how strange it would seem to be alive when we moved into a new millennium. To an imagination fed on the early science fiction programmes like Star Trek, it felt as if the world would be unrecognisable by then. In some ways it was too and many of the fanciful gadgets mocked up by the props department are now part of everyday life. These days I am more likely to wonder if I will share my grandmothers’ longevity and still be around to see the turning point of the century in 2050… and what the world will look like then as technology advances with the rapidity of a snowball while humankind remains stuck in a behavioural rut. In a few days’ time, we will all be watching the clock, waiting for yet another year to slide into the past and a new one to dawn. Celebrations from across the globe will hit our screens as midnight strikes around the world, yet we will wake to a dawn that is both no different from any other… and as unique as they always are. The first day of January will feel no different from any other day… except for the global number of hangovers. How many will wake to the vow that they are never drinking again? They won’t be the only ones making such promises, as many will take the opportunity to make a New Year resolution. The practice of making promises of good behaviour at New Year began, as far as we can tell, in ancient Babylon. There the new year was celebrated with a festival lasting eleven days in March and promises were made to the gods to return and repay what was owed in the hope that the gods would look favourably upon such actions and perhaps as a measure of gratitude for blessings received. After all, we cannot repay the gods except by being the best human beings we can. For the Egyptians, New Year fell within the season of Akhet when the annual floods brought new life to the lands of the Nile. They celebrated with a five day festival… the five ‘extra’ intercalary days that Thoth, the god of wisdom, had won from the Khonsu, the moon, and during which the younger and best known gods of Egypt came into the world… Isis and Osiris, Set, Nephthys and Horus. Here too it was a time of birth and new beginnings and each year, those five days ‘out of time’ gave an opportunity to remember and realise the reflection of the changing seasons of the land within the heart of man. The move to the first day of January as the official New Year is attributable to ancient Rome. The festival was already in place when Julius Caesar introduced the Julian calendar in 46 BC and remained the beginning of the year under the later Gregorian calendar. As the year turned, the Romans offered their promises to Janus, the two-faced god of transitions who sees both what has been and what is to come. It has been posited that Janus may have been one of the most important gods in the archaic pantheon. There was no dedicated high priest of Janus, his rites were the responsibility of the rex sacrorum, and such was the importance of Janus, he was invoked at all religious feasts, regardless of which god was presiding over the occasion. Janus faced both forward and backward and was seen as a god of change and transition, of beginnings, and of the progression of time. Poised as he is, in a moment of absolute awareness between past and future, in modern terms we could call him the god of the Now. In medieval times, knights would yearly renew their promise to adhere to the principles of chivalry. In 1312, Jacques de Longuyon wrote of the Voeux du Paon, the Peacock Vows, describing the moment and introducing the idea of the Nine Worthies… three groups of three representatives of perfect knightly virtue drawn from the Pagan, Christian and Jewish traditions. 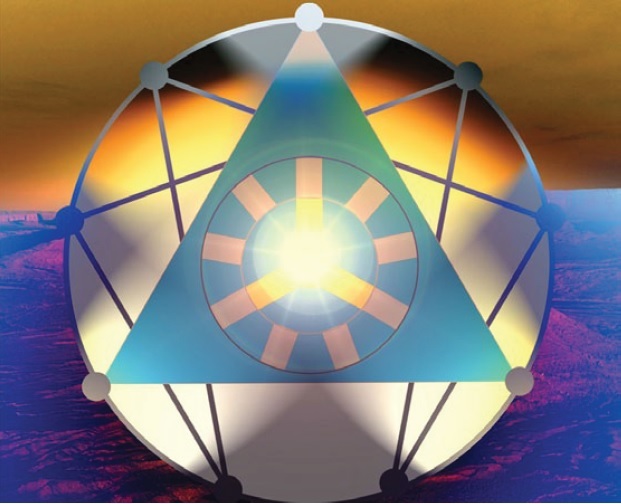 Within the Silent Eye we work with the nine-pointed enneagram as a symbol of both the human personality and the three tiered journey to Being; the symbolic possibilities of the Worthies become relevant once again. As we approach the new year, thousands of people start thinking about what they would like to change… what they intend to change, in the coming months. We know full well that three-quarters of all such resolutions will have failed and been forgotten by the end of the month named for Janus. I wonder if, by taking the sacredness out of the proceedings, we have lost an important part of our armoury against such broken promises. There are still the promises made in faith and most religions have a moment in the liturgical year for reflection and resolution to be made with a view to spiritual progress. But for the most part these days, our resolutions are more worldly. We either keep silent about our resolutions, or else state our intent to friends and family and even across social media. Few offer their promises with reverence to Deity and the thought of doing so seems to sit uneasily with most people. We do not necessarily imagine a personified god who takes a personal interest in our small doings. I do not believe we need that vision of a humanoid god in order to recognise the consciousness of the Divine at work within existence… and within our own inner life. Can we not simply recognise the spark of Light within as part of a greater Life? And if we do so, then every promise we make, even within the silence of self, becomes a sacred trust. It seems to be the case that the quiet ones get things done… and perhaps that is because they often speak to that silent listener within. Another post that hits the mark, Sue. I had a dream last night that relates to this, basically, that all change is stirred by spirit and that it comes from within. Without the deep connection, resolutions become false promises. That’s beautifully put, Eliza, and true, I believe. Wonderfully historical and thoughtful. I am reconsidering my NY’s resolutions from the view of faith. I think the difference that makes cannot be overestimated.